Wayne Rooney, Steven Gerrard, Gary Neville… If these names sound familiar to you, it probably means that you love football. Indeed, they are very famous and popular as football is the national sport in England and plays a significant role in the English culture. In international football, England is represented by the England national football team. English people are very proud of it because it is one of the only seven national teams which have won the World Cup. The national stadium is the Wembley Stadium, which is the largest one in England with its 90,000 seats. Going to the stadium is an unforgettable experience as there is an incredible atmosphere. But if you can’t afford it, you should go to a pub to watch a football match; it is likely to become your favourite activity on the evening after your English Courses. There are several well-known football teams in London: five of them are playing in the Premiere League. When you come to the English School in London, your new English friends will probably tell you about their favourite team. 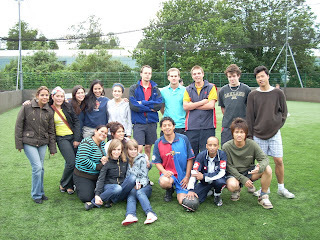 Our English School in London usually organises a match between staff and international students. It is a good opportunity for boys to show their dexterity and show off. If you are a girl and you are totally reluctant to football… just take advantage of your stay in the English School in London to have a look to an English football match when David Beckham is playing, and you will change your mind, but maybe not because of his game!